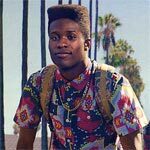 Dope is one of the sleeper hits of the summer with its throwback music to the 1990s, a compelling and interesting story, well written characters and fine performances all around but especially from a young and mostly unknown cast. Malcolm (SHAMEIK MOORE) is a geek into old-school rap who finds himself, and his two friends (TONY REVOLORI, KIERSEY CLEMONS), in the middle of an adventure involving shady drug dealers (including one played by A$AP ROCKY), offbeat weirdos and a backpack that can make or break his chance of getting into Harvard. This release comes with a matted slip cover. Inside are a standard DVD Copy and a redemption code for the Digital HD copy. Dope is Different (3:21; HD) and Dope Music (3:29; HD) are basic, almost promotional, featurettes with interviews by the cast and crew as they talk about their characters and/or the music featured. 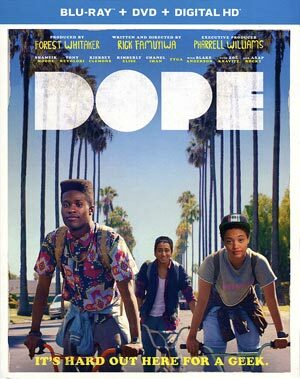 Dope is presented with a 2.35 widescreen aspect ratio and given a 1080p high-definition transfer (MPEG-4 AVC codec). The movie looks great in HD with sharp detail levels throughout and bright colors making it shine well on the small-big screen. There were no apparent issues like artifacts or aliasing and there’s only a moderate amount of natural noise giving it a film-like quality. Where the film excels is with the strong DTS-HD Master Audio 5.1 track. From the opening as Naughty by Nature’s “Hip Hop Hooray” playing and the bass kicks it into gear shaking the floor and even walls followed up by any number of great songs from the 90s. Even still, the dialogue sounds crisp and clear and when there is action, such as music at a nightclub, the ambient noises make great use of the front and rear channels spreading things evenly out making for a near theater-like experience. 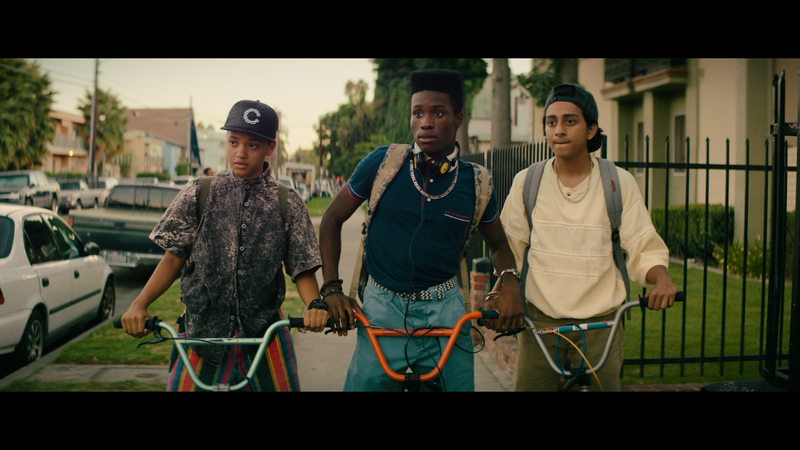 Overall, Dope is one of the sleeper hits of the summer with its throwback music to the 1990s, a compelling and interesting story, well written characters and fine performances all around but especially from a young and mostly unknown cast. The Blu-ray released by Universal offers up excellent video/audio transfers but the bonus material is lacking.